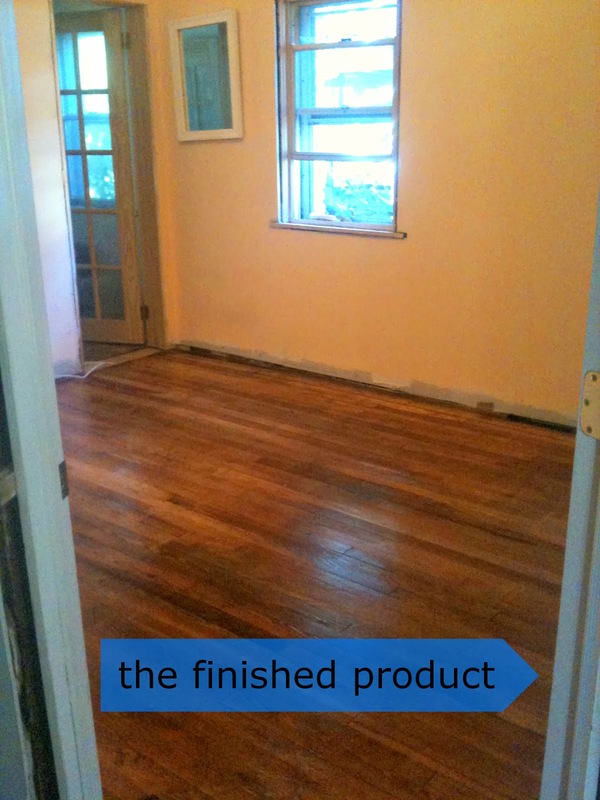 this past weekend, devin and i sanded down and sealed our hardwood floors (on the first floor). UMMM it's a little bit painful that 20-something hours of work can be summed up in one sentence. but, that's what we did. the prep for the sanding was not pretty: we shoved our couches and end tables onto the porch and covered them with plastic, which made us look SUUUPER CLASSY and all the neighbors must have really appreciated it. not. our dining room table, chairs, and china closet were piled into the kitchen, and then the real work began. if you are unexperienced, like me, the phrase "sanding & sealing floors" might conjure up running around with a big push sander that magically makes things smooth, and then you dump some clear stuff on the floor and swish it around. not the case. we did the main section of the floor with a rented, enormous push sander (that's probably not even the right term for it, but as i said, i am unexperienced) in 60 grit. 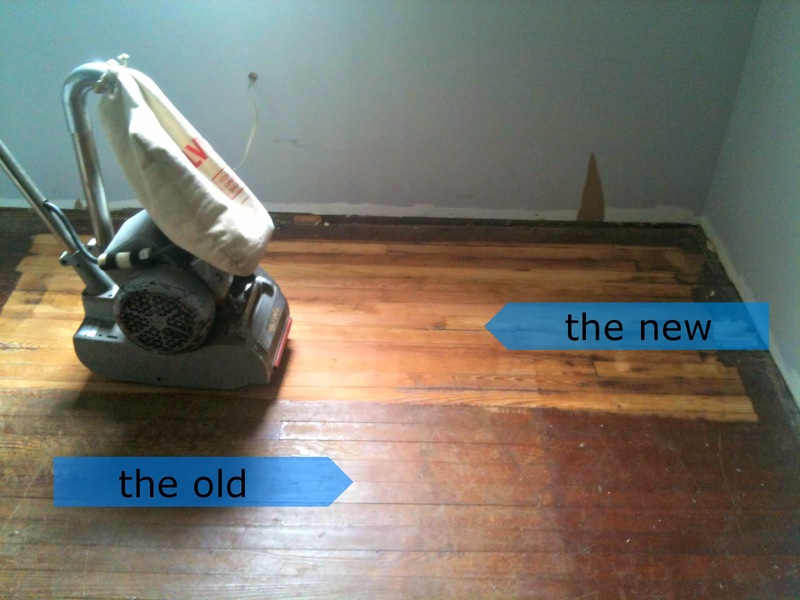 then you do the edges of the room with a belt sander, in 60 grit. then a palm sander goes over what the belt sander missed, also in 60 grit. then you do the whole process 3 more times with finer and finer sand paper until the floors are super smooth, thanks to 220 grit sand paper. now picture that process on 3 rooms! and our house is super small so it seemed like it would go super quick! again, not the case. i had just started in on the dining room with the 60 grit (aka step 1) and the belt sander. my dust mask and safety glasses were in place, and i was humming a little tune in my head for motivation. AND THEN I BROKE THE BELT SANDER. embarrassing moment, as i had to stop devin for like the one millionth time (where are the dust masks? have you seen my safety glasses? where are the 60 grit papers?) and be like "ummmm....devin? i think i broke this." the sand paper had jammed and the little machine was smoking. also a semi-funny scenario: on saturday, devin and i did our living room and bedroom floors, so we put our dressers and our queen-sized bed in the dining room. and by saturday night, we had just finished sealing the floors in those 2 rooms, which meant we had to sleep in our dining room, surrounded by bedroom furniture, like we were a bunch of hoarders. seriously, i wish you could have seen how crazy we looked. also we had to leave our living room furniture on the porch because the living room floor was still drying! talk about a hectic weekend. yea but look how awesome it looks!!! Way to go!